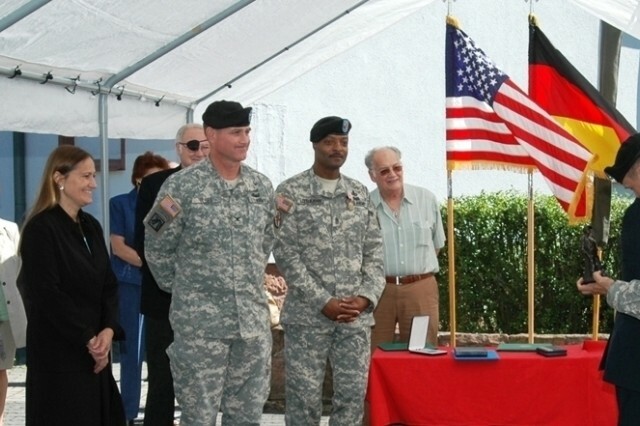 DARMSTADT, Germany - With a lump in the throat and the gift of an American flag to this city's lord mayor, U.S. Army Garrison Darmstadt officials ended six decades of service for the installation at its inactivation ceremony Aug. 5. A strong turnout of former employees and retirees - some of whom had traveled considerable distances to attend - joined the garrison's Soldiers and civilians at Cambrai-Fritsch Kaserne to pay their respects. The crowd dwarfed two small troop details - one American and one German - of Soldiers from the garrison's Headquarters and Headquarters Detachment and the Bundeswehr's Versorgungs-und Instandsetzungszentrum (Supply and Maintenance Center). 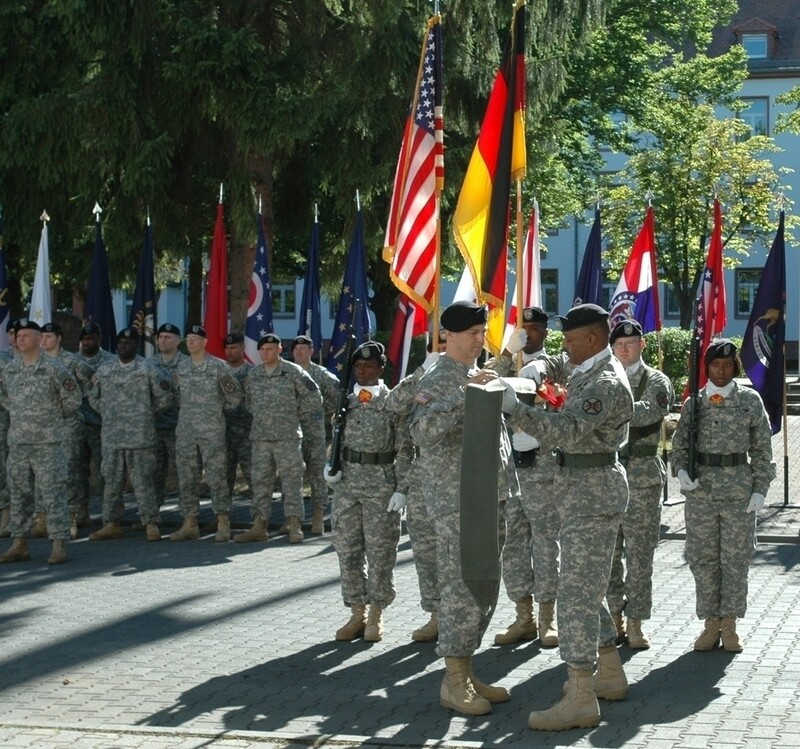 Under a gorgeous blue sky, and to the accompaniment of music by the U.S. Army Europe Band, members of USAF Darmstadt cased the organization's colors for the last time. "How does one sum up in a few short minutes the many memories built upon more than 60 years of friendship'" said garrison commander Lt. Col. David Astin. "There is no possible way of doing justice to something of this magnitude," admitted Astin, "so I will simply remind us of the words of Albert Schweitzer that the important things in life are the signs of love and friendship that we leave behind when we go away. "You could see such signs at the farewell fest here on Cambrai Fritsch Kaserne on 30 May as the citizens and Lord Mayor of Darmstadt graciously said thank you" to their American friends. "You could see the signs as city officials prayed for the safety of our Soldiers deploying to combat and welcomed them warmly when they returned. "You could see the signs on that terrible day in September 2001, a day of indescribable sadness in Darmstadt's history as well, as the local citizens laid flowers at our gates and embraced us while we mourned." "It is our shared experiences," Astin added, "the friendships they have inspired which make today a day of celebration and thanks - thanks that we have been blessed to live with neighbors who have made this such a warm and caring community." 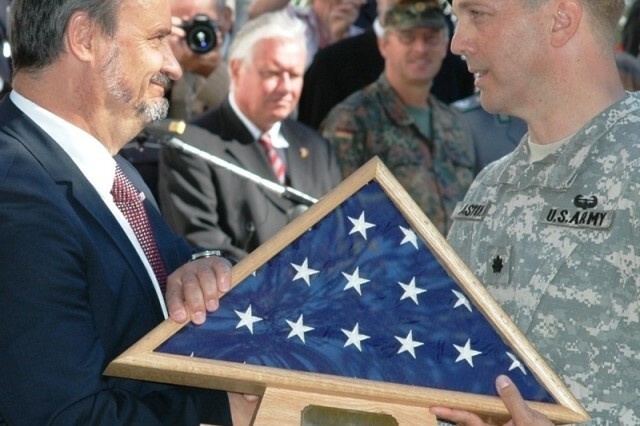 As the color guard marched off with the garrison's cased colors, the installation's last commander strode over to Darmstadt Lord Mayor Walter Hoffmann and presented him with an American flag, folded in a triangular wooden case, with the inscription: "To The City of Darmstadt, flown in freedom and friendship over Cambrai-Fritsch Kaserne." "In the name of the magistrate and the citizens of Darmstadt I sincerely thank you for this precious gift," said Hoffmann at a small awards ceremony that followed the main event. "We appreciate it as a symbol of all gifts of the USA and its people and of friendship," the lord mayor said. "It also is a symbol of the pride of your nation, of the most powerful democratic country that the world has ever seen. We will cherish this flag." Hoffman added that the closing ceremony today provided "a deeply moving moment, because in some sense it represents the end of the postwar period for Darmstadt." "Sixty-three years ago," he noted, "soldiers of the U.S. Army brought peace, freedom and democracy to our city. In the past sixty years we have enjoyed your protection. By your presence, you have ensured the independence of West Germany, preserved our freedom and given Europe the longest period of peace ever. "But you also have changed the Germans beyond the political scope," Hoffman continued. "You have deeply influenced and modernized our society and our culture through music, through swing, jazz, rock and roll and pop; through coke, chewing gum, petticoats, Woodstock, JFK and 'I have a dream;' through candy bombers and comics; through your liberality; your fairness and your love for the individual. Germany today bears only little resemblance to the Germany of the decades before the Second World War," said Hoffmann. "So I willingly repeat what I have said on the 30th of May at the German-American Freundschaftsfest: We all have become Americans - a little bit at least. And that is good indeed." 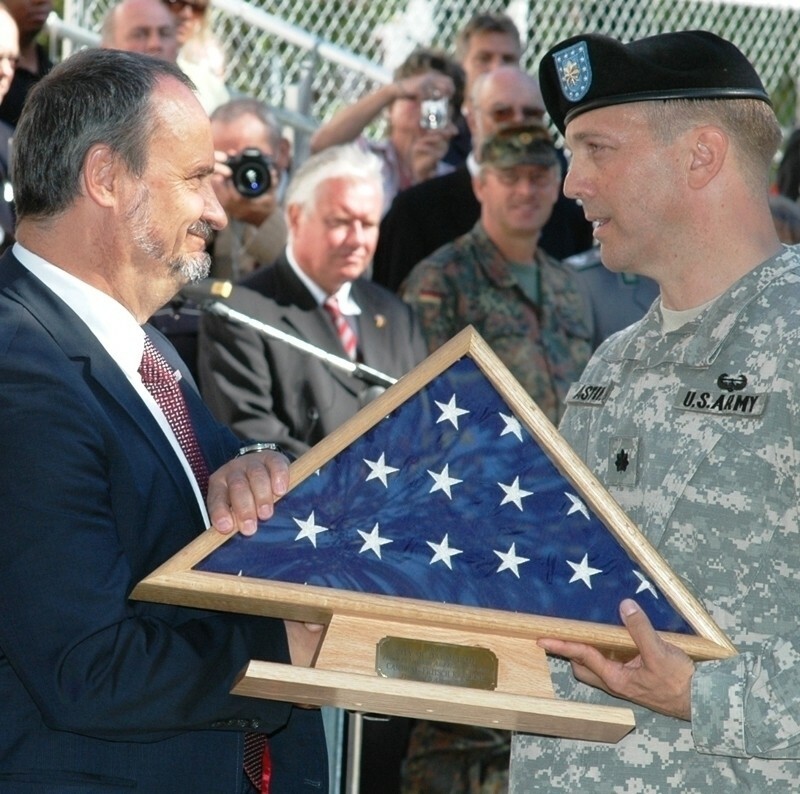 Hoffmann presented the city's "Freundschaftsplakette," or friendship medal, to Astin, whose next assignment is in Afghanistan. "We hope that the staff canteen of the German police in Kabul (Afghanistan) is as good as we have been told," said Hoffmann. "When you sit there ... eating German roast, please think of Darmstadt a little bit. "But more important: Please come back safely." 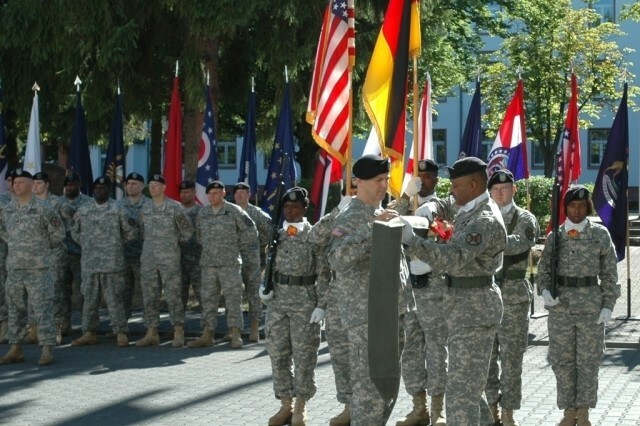 During the ceremony, Col. Robert Ulses, commander of U.S. Army Garrison Baden-WAfA1/4rttemberg, lauded Astin's leadership of the garrison as it closed down. "Lt. Col. David Astin has commanded his garrison to the highest standards to the very end; he continually motivates people with his positive outlook on life and 'can do it' attitude. Through his personal involvement, he has drawn down the operations of his command with as little impact to the tenant units and garrison workers as possible," said Ulses. Ulses said that most employees had been placed in other garrisons, and many installations had been turned over to the German government "well ahead of schedule." He pointed out that the garrison had provided a home for 25 military units, 12 community service providers, ad more than 8,000 Soldiers, civilians, family members and retirees on 22 installations in two German states. Ulses also joked about Astin's penchant for including cake cuttings at every ceremony, and how "he even learned how to tap a keg without getting all the VIPs and himself wet." "I would again like to thank the city of Darmstadt for the warm relations and the support they have given to the members of the U.S. forces stationed in their community," said Ulses. "And while we will inactivate the garrison, there will continue to be small enclaves of U.S. forces remaining in the immediate future that will continue to enjoy your hospitality." The official inactivation date for U.S. Army Garrison Darmstadt is Sept. 30, but almost all services and facilities have already ceased. The last will be the commissary, which closes its doors Aug. 8. And the last remaining 24 families in housing will have moved by month's end. Even after the inactivation, however, there will be two units in Darmstadt until new facilities are constructed for them elsewhere: The Dagger Complex on Eberstaedter Weg, and the Defense Threat Reduction Activity on Nathan Hale Depot. They will receive base support from U.S. Army Garrison Wiesbaden until then. A closure team will remain on Nathan Hale Depot to attend to the many administrative and technical details that must be resolved before the turnover. They will be working in close coordination with the German federal, state and local authorities.